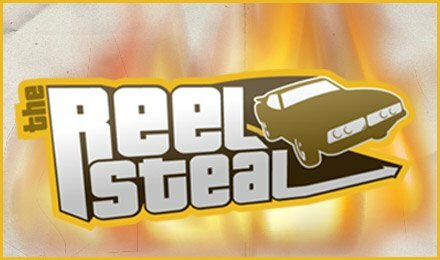 Reel Steal slot is a 5 reels and 9 paylines game created by NetEnt. Launch now at Moon Games Casino on your mobile, desktop or tablet and enjoy an array of features available to trigger. You can benefit from wild substitutions, free spins, scatters and more! Themed on a heist, join the action on this well-designed slot grid, which is completely surrounded by safe combinations. Manage to crack one and all the loot is yours. While rolling the reels of this slot game, benefit from symbols like cops, gangsters, bags of money, safes, briefcases, cameras and guns. Clicking on the left or right buttons on the Coin Value Field allows you to adjust your stake values easily. The Max Bet button allows you to play the game at the highest level and the current coin value. Your aim in the game is to make combinations of three or more similar symbols on active paylines from left to right of the slot grid. Amount of Paylines Selection: All 9 paylines are fixed. Coin Values: Default coin values range from £0.01, £0.02, £0.05, E1.00, £2.00 and £5.00. The Wild symbol of the game takes form of the Yellow Sports Car. This symbol replaces for all other symbol bar the scatter symbol of the game. In the base game, when the wild forms part of a winning combination, 5x your stake is awarded. During the Free Spins Feature, when a wild forms part of a winning combination, 25x your stake is awarded. The scatter symbol takes form of the Dynamite, which triggers the free spins feature. Land three, four or five scatter symbols anywhere on the grid and win 15, 20 or 25 free spins respectively that all multiplied by 5x. Landing more scatter symbols during the play of the feature awards additional free spins.